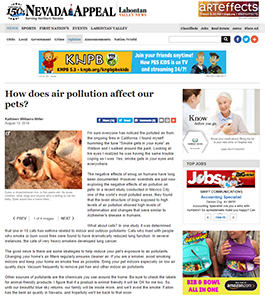 Have you ever wondered how air pollution affects pets? The use of canary’s to detect toxic gases in coal mining, a tradition (no longer practiced) dating back to 1911, suggests animals can be more sensitive to gases and air pollution than humans. Exposure risk analysis and medical science tell us that smaller humans respond to lower does of pollutants or medications. We have long understood these theories as they relate to humans, however scientists are now just starting to explore the impacts of air pollution on pets. A study recently conducted in Mexico City found changes in the brain structure of dog exposed to high levels of air pollution. Brain inflammation and changes in the brain similar to Alzheimer’s disease in humans were also found. In another study 1 in 10 cats were found to develop asthma from indoor and outdoor pollutants. Cats who live with people who are smokers or burn wood fires showed decreased lung function and cats of heavy smokers developed lung cancer. If you are a smoker, smoke outside (at least 25 feet away from all doors, windows, or air intakes). Keep the indoors as smoke free as possible. Third hand smoke (toxins and residues from smoking) have actually been shown to spread inside in a recent study by Drexel University. Bring pets inside on low air quality days. Vacuum frequently to remove pet hair and pollutants. Check labels for animal friendly products. Many people consider their pets like additional children, which may be a good way to consider their health as it relates to air pollution. Click here to read the original article.